No One Saw This Economic Crisis Coming? A research paper, published in June by Dirk J. Bezemer, Groningen University, addresses this question and says the answer is that many saw it coming but those with the power to act did nothing. Bezemer contends that the problem is that economic policy is executed using macro equilibrium models and what is needed to establish economic policy that can anticipate crises, such as we have now, and take actions to head them off, are micro accounting cash-flow models. The entire paper can be read here. 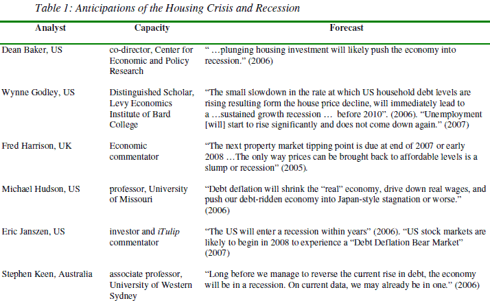 First, let me show you a table that Bezemer has prepared lisiting some of those who saw it coming. Table is in two parts for graphics processing reasons. In a lengthy appendix, Besemer analyses in detail what each of the individuals did over extended periods of time to highlight the then incipient crisis. 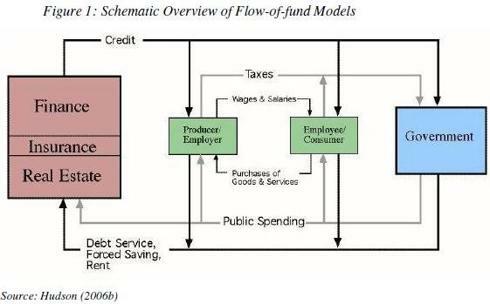 They are ‘accounting’ models in the sense that they represent households’, firms’ and governments’ balance sheets and their interrelations. If society’s wealth and debt levels reflected in balance sheets are among the determinants of its growth sustainability and its financial stability, such models are likely to timely signal threats of instability. Models that do not – such as the general equilibrium models widely used in academic and CentralBank analysis – are prone to ‘Type II errors’ of false negatives – rejecting the possibility of crisis when in reality it is just months ahead. Moreover, if balance sheets matter to the economy’s macroperformance, then the development of micro-level accounting rules and practices are integral to understanding broader economic development. This view shows any clear dividing line between‘economics’ and ‘accounting’ to be artificial, and on the contrary implies a role for an ‘accounting of economics’ research field. Thus this paper aims to encourage accountants to bring their professional expertise to what is traditionally seen as the domain of economists - the assessment of financial stability and forecasting of the business cycle." 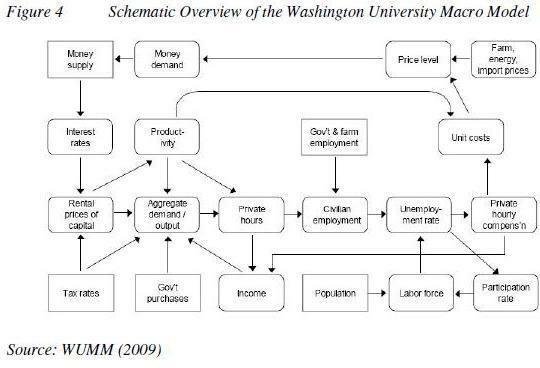 The following graph is how Besemer defines the general structure of accounting models. The finance, insurance and real estate (FIRE) sector includes all sorts of wealth-managing nonbankfirms (pension funds, insurers, money managers, merchant banks, real estate agents etc. ), as well asdeposit-taking banks, which generate credit flows. It is conceptually separate from the real sectorwhich comprises government, firms and households. Liquidity from the FIRE sector flows to firms,households and the government as they borrow. It facilitates fixed-capital investment, productionand consumption, the value of which - by accounting necessity - is jointly equal to real-sectorincome in the form of profit, wages and taxes plus financial investment and obligations (principally, interest payments). Funds so originate in the banking part of the FIRE sector and either circulate in the real economy, or they return to the FIRE sector as financial investments or in payment of debt service and financial fees. Total credit flows (in nominal currency units) are normally increasing year on year, reflecting positive profit and interest rates. An accounting (or balance sheet) view of the economy makes clear that this dynamic – a bubble – is unsustainable in the sense that it is constrained by the real economy’s ability to service debt. Yet without policy intervention, it can last for many years or even decades, if starting from low levels of indebtedness. A burst occurs as investors realize this constraint is approaching or has been reached. The severity of the impact of a burst will be the larger as real-economy consumption (and thereby production) have grown more dependent on capital gains rather than on wages and profit. This ‘financialisation’ scenario is a self-sustained dynamic separate from real-sector fundamentals (in other words, a bubble) increasing debt burdens but not bolstering the real economy’s potential to create valued added from which to repay its growing debt. It is typically driven by the psychological and political economy factors discussed in section 3. In terms of financial incentives, its impetus is that it brings increased asset price gains for a time, but this is unsustainable in the long term as a source of debt servicing. Borio (2004:5) writes that “contrary to conventional wisdom, the growth of markets for tradable instruments … need not have reduced the likelihood of funding (liquidity) crises”. On the contrary, applying an accounting lens demonstrates that because of the debt growing in parallel with tradable instruments, inevitably a bad loan problem (or debt crisis) develops, credit flows dry up –either in a ‘soft landing’ or in a ‘credit crisis’ - and a repositioning of financial portfolios and real-sector activity follows. The difference with sustainable financial innovation is difficult to draw while a financial bubble lasts, and mostly absent in the mainstream and popular discourses. The “WUMM” is a quarterly econometric system of roughly 600 variables, 410 equations, and 165 exogenous variables. Figure 4 presents a schematic overview. The boxes indicate the variables included in the model. In the present context, the important observation is that all are real-sector variables except the money supply and interest rates, the values of which are in turn fully determined by real-sector variables. In contrast to accounting models, the financial sector is thus absent (not explicitly modelled) in the model. In other words, the elements in the economy that are at the root cause of the current crisis are absent from the models of economic activity that are used to guide economic policy. The entire financial sector is absent. The very elements that have siphoned the life blood out of the economy have been completely off the radar screen. The FIRE was hidden behind a shield of invisibility, just pumping money into their coffers until the real economy bled out. 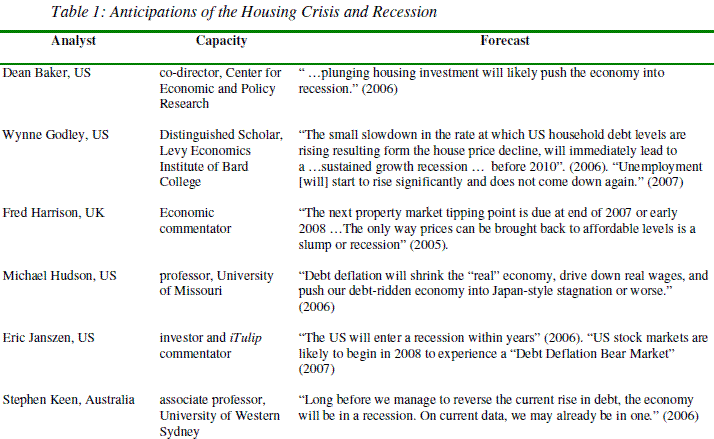 Perhaps because of this omission,Macroeconomic Advisers chairman Joel Prakken could tell Reuters as late as September 2007 that the probability of recession was less than 50%, a “slightly higher risk than it was a month ago but not a dominant risk.” This was well after Godley and associates in April 2007 had predicted output growth “slowing down almost to zero sometime between now and 2008” and in November 2007 forecast “a significant drop in borrowing and private expenditure in the coming quarters, with severe consequences for growth and unemployment”. Bezemer concludes that the reason this condition exists is that macro equilibrium theory dominates academia and has become institutionalized in governments. He defines the objective of his paper to encourage the merging of accounting and economic theory. He has some interesting things to say about factors that are missing from the macro equilibrium view, factors highlighted by John Maynard Keynes. Most of the analysts discussed in the Appendix reject rational equilibrium on the basis of arguments related to economic psychology and to the Keynesian notion of ‘radical uncertainty’ (as opposed to calculable risks). Keen, in a 1995 article titled ‘Finance and Economic Breakdown’ explained that “Keynes argued that uncertainty cannot be reduced to ‘the same calculable states as that of certainty itself’ whereas the kind of uncertainty that matters in investment is that about which “there is no scientific basis on which to form any calculable probability whatever. We simply do not know” (Keynes, 1937:213-24). Keynes argued that in the midst of this incalculable uncertainty, investors form fragile expectations about the future, which are crystallized in the prices they place upon capital sets, and that these prices are therefore subject to sudden and violent change. Bezemer points out that the critical elements of human behavior and confidence are not reflected in the snapshots of the macro equilibrium models, but are amenable to modeling in a flow-of-cash model. He is not proposing that the macro models be discarded; he feels they should be supplemented and expanded to include flow-of-cash factors. Bezemer feels research is needed to develop such an accounting lens addition to macro modeling. I hope Bezemer's work gets the attention it seems to me it deserves. 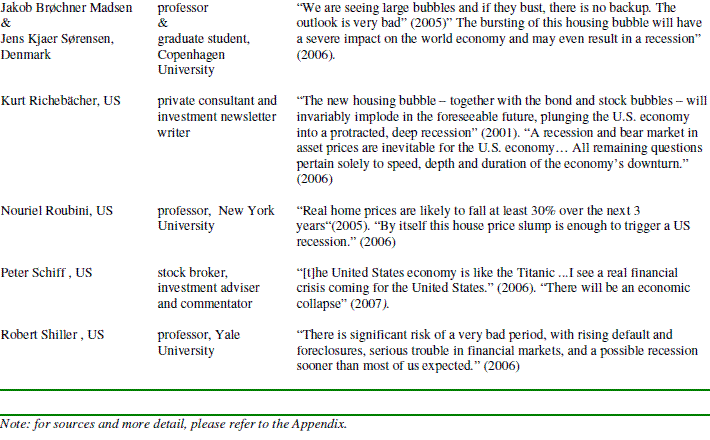 Hat tip to Barry Ritholtz (The Big Picture) for putting Bezemer's paper on his Friday afternoon reading list.